Put the cider and rosemary sprigs in a small non-corrodible saucepan. Set over a low heat and gently bring up to the boil - but don't let it bubble. Tip into a china bowl, cover and leave until cold. Then mix in the sugar, Calvados and strips of lemon peel. Cover and chill until the next day. Strain the liquid into a bowl. Add the lemon juice then gradually whisk in the double cream. Keep whisking until it forms soft peaks. The syllabub is now ready to serve. If preparing just before a meal, spoon into glasses and chill until ready to eat. 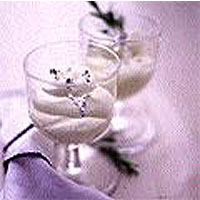 Otherwise, leave the syllabub covered and chilled until ready to serve. If left for more than about 12 hours, the cider may separate from the cream - just gently whisk it together again.